This is a guest post from my GW colleague Stephen Kaplan. In each election cycle, China becomes the Darth Vader of U.S. trade politics. During the last three elections, congressmen from Maine to California have bashed the Chinese for their currency practices, calling them “mercantilists,” “cheaters,” “international bandits,” and even “yelping dogs.” At the 2012 presidential debates, Chinese currency manipulation took center stage. President Obama firmly insisted “China plays by the same rules as everyone else,” while Governor Romney doubled-down saying that “on day one I will label them a currency manipulator which allows us to apply tariffs where they’re taking jobs.” Are the claims justified? Is China’s currency policy unfairly boosting its trade? Or, are politicians simply being politicians, and orchestrating nationalist sentiment to benefit electorally? These barbs certainly fit an electoral pattern. According to Google trends, the level of interest in Chinese currency manipulation, as gauged by Internet searches and news related stories, typically peaks in October just before November elections. Politicians raise the volume of their anti-Chinese rhetoric to appeal to working class voters in rust-belt states hit hard by manufacturing job losses. They claim that China unfairly benefits from an undervalued currency that erodes U.S. competitiveness, balloons its bilateral trade deficit, and silences its factories. 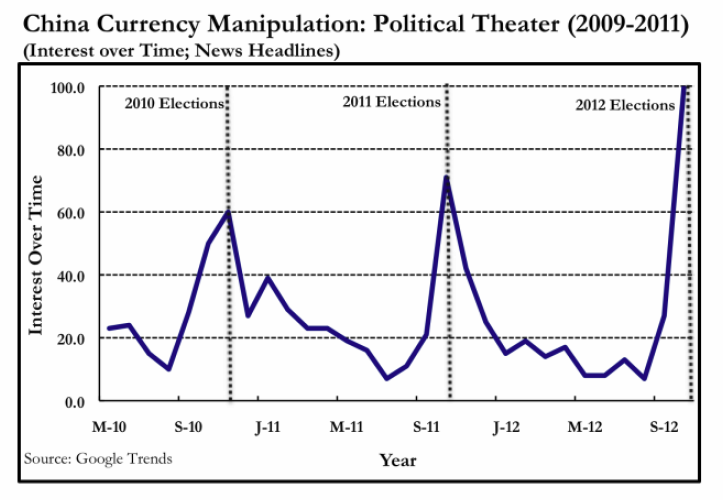 At the height of the 2010 electoral uproar, the House passed legislation seeking to identify and take punitive actions against currency manipulators. The Senate approved similar legislation in October 2011. Notably, however, neither initiative progressed following elections. What will happen this year? Is there any chance President Obama will press the issue with the election now is in his rear-view mirror? It is very unlikely. Political clamoring about China’s unfair currency practices embodies little economic truth today. In the mid-2000s, there was a heated debate in U.S. policy circles about whether Chinese currency appreciation would shrink the bilateral trade deficit and spur U.S. competitiveness. On one side, scholars and practitioners claimed that such a revaluation would decrease the relative price of U.S. exports, leading to greater demand for American goods, falling demand for Chinese goods, and an adjustment of trade balances. Others were more skeptical, arguing that currency revaluation would do little to address the U.S.’s global trade imbalances. Rather, they deemed that higher domestic savings was the necessary cure for U.S. deficit ills. Today, there is far less economic debate. The Chinese currency has appreciated by more than 20 percent since 2006, while its current account surplus has significantly narrowed. The reality is that China, under the stewardship of President Hu Jintao, has actually been a good economic partner. Not only has it revalued its currency, but it also helped support the U.S. economy with steady debt purchases. China’s vast arsenal of U.S. dollar reserves (which account for almost 50 percent of its GDP) – is the by-product of its currency interventions. In foreign exchange markets, China sells its currency for U.S. dollars, with the aim of suppressing the value of its currency and boosting its export competiveness. Ironically, these dollars are funneled into U.S. treasury securities, which have helped keep interest rates low in the U.S. and eased the fallout from the financial crisis. Having such a low interest rate credit facility at a time of economic distress is not common, however. In my forthcoming book, Globalization and Austerity Politics in Latin America, I find the structure of debt has an important effect on creditor behavior, creating enormous differences in the policy climates, and ultimately, the funding costs for sovereign borrowers. When a few major bank lenders or public institutions hold national debt, the financial interest of creditors and debtors are linked together. This symbiotic relationship provides sovereign borrowers with the promise of new funds, and a longer-term horizon to work out their economic woes. By contrast, the dispersion of ownership that is characteristic of global bond markets leaves creditors with a low personal stake in borrower solvency. Their threat of capital withdrawal imposes a shorter-term deadline for economic reform. From East Asia to Latin America, for instance, past financial crises were often characterized by private bond investors’ capital flight from domestic assets. Such actions translated into dramatically higher interest rates for governments, firms, and individuals that depressed investment and consumption, and gravely impaired economic recoveries. By contrast, the U.S. has benefited from its reserve currency status. In fact, “currency manipulators” from around the world, including Taiwan, Singapore, and Brazil, have parked newly acquired foreign reserves in U.S. assets after stemming their own currency appreciation pressures. With these public institutions included among its major creditors, the U.S. is less subject to the whims of short-term private capital. Compared to countries that lack such reserve currency status, the threat of capital withdrawal does not impose short-term discipline and difficult economic adjustment. Borrowing from public actors with a long-term stake in the global economic system has uniquely afforded U.S. policymakers a longer-time horizon to address its fiscal woes and restructure its economy. For example, China continues to invest in the U.S. economy notwithstanding its moribund recovery. By helping prop up U.S. demand, a key engine of the global economy, China provides fuel for its export-led growth that is vital to the country’s job creation and social stability. In light of this economic interdependence, any talk of Chinese currency manipulation is likely to fade following the elections. With the longer-term horizon afforded by China and its other creditors, the key question will be whether the U.S.’s reserve currency status will prove to be an asset or liability. The benefit of time might help spur sustainable economic reforms, but it might also leave the U.S. mired in its political gridlock and budgetary woes. 2 Responses to Hu’s to Blame for Our Economic Woes? Very interesting piece. I appreciate you pointing out that current account deficits are nothing more than capital account surpluses and dollars held by Chinese abroad must eventually return to the United States. If they don’t, China has basically agreed to ship us lots of real, tangible stuff for nothing more than green pieces of paper with pictures of dead presidents on them. That, to me, sounds like a wonderful deal. Wondering whether your research touches on the benefits accrued to the Untied States by having its debt denominated in its own currency. Not sure about Latin America, but following the East Asian crisis in 1997-1998, most states seem to have opted for debt instruments denominated in their own currency. Have you found similar trends and if, not, can you speculate as to why? Thank you for forwarding the article. Yes, Latin America has experienced a similar phenomenon to East Asia. In response to financial volatility, they have built up their reserve arsenal and reduced their reliance on foreign currency bonds. In fact, since the early 2000s, they have deepened the size and liquidity of local bond markets by improving market infrastructure, strengthening regulation, and providing a baseline of prudent macroeconomic governance throughout much of the region.